Fourth in a series on what Harvard scholars are doing to identify and understand inequality, in seeking solutions to one of America’s most vexing problems. If you want to get an idea of the gap between the world’s sickest and healthiest people, don’t fly to a faraway land. Just look around the United States. Health inequality is part of American life, so deeply entangled with other social problems — disparities in income, education, housing, race, gender, and even geography — that analysts have trouble saying which factors are cause and which are effect. The confusing result, they say, is a massive chicken-and-egg puzzle, its solution reaching beyond just health care. Because of that, everyday realities often determine whether people live in health or infirmity, to a ripe old age or early death. Scholars say that inequality in health is actually three related problems. The first, and most critical, involves disparities in health itself: rates of asthma, diabetes, heart disease, cancer, drug abuse, violence, and other afflictions. The second problem involves disparities in care, including access to hospitals, clinics, doctors’ offices, skilled professionals, medical technology, essential medicine, and proper procedures to deal with illness and disease. The third problem, one that has grabbed national headlines in recent years, is inequality in health insurance, the financial means to pay for the care people get to stay well. The three problems, scholars say, require interlaced solutions. President Obama’s signature health care law, the Patient Protection and Affordable Care Act (ACA), has taken important strides in narrowing the gap in health insurance coverage, but those gains so far have translated to limited advances in ensuring access to quality medical care and even less progress in making diverse groups equally healthy. “That’s an area where there’s less progress and more disappointment,” said John McDonough, professor of the practice of public health at the Harvard Chan School. McDonough has worked on health care reform both in Massachusetts, which created the model for national care, and at the federal level. Disparities are built into the health care landscape, but there has been great progress in recent decades, according to S.V. Subramanian, professor of population health and geography at the Harvard Chan School and the Harvard Center for Population and Development Studies. Life expectancy is increasing for African-Americans and the poor, albeit at a lower rate than for wealthy whites. Although stark disparities remain, the overall health picture in this country is one of improvement, analysts say. “I sometimes feel that the public health narrative is all doom and gloom, but that’s inaccurate,” Subramanian said. Still, the remaining disparities are bell-clear in one of the bluntest measures of health: life expectancy, which varies, depending on a resident’s race and ethnicity, as much as 30 years between the richest and poorest U.S. counties. That gap, Kawachi said, covers about two-thirds of the range seen between the world’s healthiest and unhealthiest populations. In addition, a new study by the Brookings Institution found that the gap has widened considerably. An upper-income man born in 1920, for example, could expect to live five years longer than someone at the lower end of the income spectrum. But for men born in 1940, that life-expectancy divide based on income has more than doubled, to 12 years. Health disparities are a major reason why U.S. life expectancy trails many peer nations, Kawachi said. 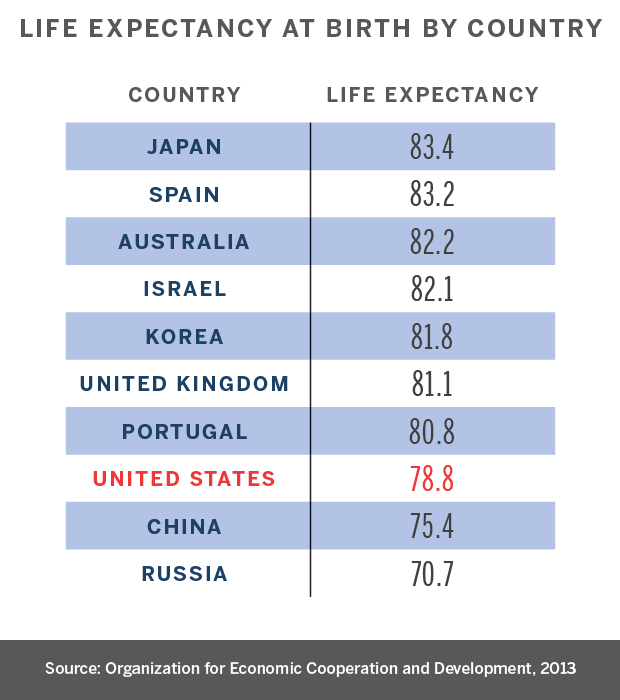 According to a 2014 report by the Organization for Economic Cooperation and Development (OECD), U.S. life expectancy in 2012 was 78.7 years, 27th out of the group’s 34 industrialized democracies. Health disparities form along several societal fault lines, but analysts say the deepest and most persistent divide surrounds income. America’s poor — of any race or ethnicity — are sicker than well-off Americans, Kawachi said. They get substandard care, live in poor housing and degraded environments, and have higher rates of suicide, violence, drug overdose, accidents, and smoking. Disparities due to poverty hurt racial and ethnic minorities more than other groups because they make up a large proportion of the poor. Not only do they have more ailments, but they often get worse care. Though health professionals generally care deeply about their poor and minority patients, the problem nonetheless may be rooted in racism, according to David Williams, Florence Sprague Norman and Laura Smart Norman Professor of Public Health at the Harvard Chan School and professor of African and African-American studies in Harvard’s Faculty of Arts and Sciences. In a recent article in the Journal of the American Medical Association, Williams, along with colleague Ronald Wyatt, cited a 2003 Institute of Medicine report that labeled widespread “implicit bias” for differences in the care that African-Americans and other minorities receive. They said that substandard care leads to an estimated 260 premature African-American deaths each day. The result of that disparity and others fuels another one: shorter life spans for African-Americans, according to Thomas McGuire, professor of health economics in Harvard Medical School’s (HMS) Department of Health Care Policy. “In terms of health, there’s approximately a five-year penalty for being African-American compared to being a white male,” McGuire said. While poverty, race, and ethnicity are key divides between wellness and ill health, another factor — often ignored — is geography, according to Katherine Baicker, C. Boyden Gray Professor of Health Economics at the Harvard Chan School and acting chair of the Department of Health Policy and Management. Health disparities exist regionally across America — Southern states, for example, have poorer care, according to a 2014 government report. There also are smaller pockets of poverty, such as depressed urban areas. Ebonie Woolcock, a Harvard Medical School instructor in obstetrics, gynecology, and reproductive biology, works today not far from where she grew up in Boston’s Dorchester neighborhood. A physician at the Bowdoin Street Health Center, Woolcock is fighting a personal battle to close the health gaps that result in America’s poor and minority communities getting less access to care, poorer quality of it, and, ultimately, worse health. Easily the most significant recent step to lessen health disparities came when Congress passed the ACA in 2010. The law requires people above a certain income to have health insurance, and it expands the Medicaid program to cover those who can’t afford it. 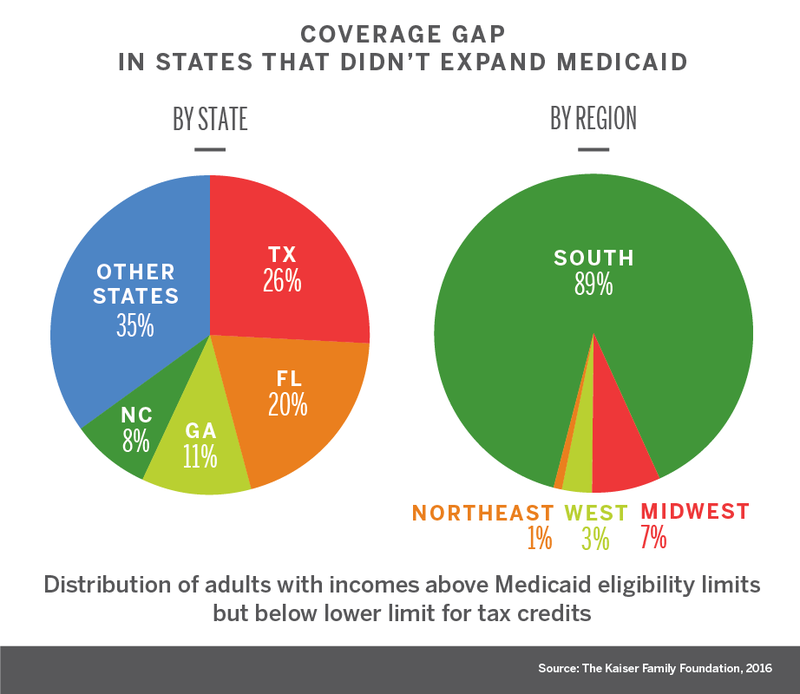 A 2012 Supreme Court ruling created a significant pothole on the road to universal coverage, however, allowing states to opt out of the Medicaid expansion. That left 4 million poor Americans in 20 states ineligible and on their own. “Under the ACA, we created a new structure where just about every American citizen and legal resident has access to some kind of affordable health insurance coverage, except for poor adults in states that have not accepted Medicaid expansion under the ACA,” McDonough said. Despite that large pool of uncovered people, McDonough said, the ACA has clearly reduced health inequalities in much of the nation, particularly for minority and ethnic groups. The act also has reduced disparities in medical care and in health status, according to McDonough and McGuire. By requiring insurance companies to cover people regardless of pre-existing conditions, it has worked to level the financial gap between the sick and the well. Though researchers will require time to prove whether illness and chronic disease have dropped as a result, early studies — including one in 2012 by Benjamin Sommers and another last September led by Joshua Salomon, both at the Harvard Chan School — indicate that health insurance coverage can prevent tens of thousands of premature deaths and prompt more than 650,000 people to control chronic conditions such as diabetes, high blood pressure, and high cholesterol. Substandard care leads to 260 premature African-American deaths daily. “What’s fairly indisputable is that by expanding coverage to so many millions of otherwise uninsured Americans, we’re saving lives,” McDonough said. McDonough said that Oregon presented researchers, led by the Chan School’s Baicker and Amy Finkelstein at the Massachusetts Institute of Technology, with a natural experiment when it used a lottery to expand its Medicaid program in 2008. The lottery was a randomized control designed to show that people newly covered by Medicaid took advantage of more preventive care, prescription drugs, and doctors’ office visits to stay healthy, as well as more hospital stays and emergency department visits to treat worsening conditions. Their self-reported access to care and quality of care both rose. In addition, they reported better health and lower rates of depression. The study did not show improvement in several measures of health involving chronic conditions such as high blood pressure, high cholesterol, or diabetes, Baicker said. But there was progress in improving patients’ financial stability. People covered by Medicaid had far fewer bills sent to collectors, and catastrophic out-of-pocket medical expenses were virtually eliminated. While the ACA was designed to provide that stability nationally, it isn’t perfect, Jha said, and the endless partisan debate surrounding it in Washington, D.C., and in some states has blocked needed fixes, according to analysts. One provision of the measure that Jha finds troubling was supposed to improve patient care by penalizing hospitals with poor patient outcomes. But that provision, he said, backfires where large, urban, safety-net hospitals are involved. Since they serve a disproportionate number of poor people with chronic ailments, they often have worse outcomes that are unrelated to care. “I do worry that it will worsen disparities,” Jha said. “There’s good empirical data; the penalties are disproportionately targeting safety-net” hospitals. While the ACA was a giant step in bridging America’s health divide, analysts say that merely providing health insurance isn’t enough. Insurance helps equalize access to care, but disparities remain in the quality of that care. However, there are levers to tackle that problem too, according to Amitabh Chandra, Malcolm Wiener Professor of Social Policy at the Harvard Kennedy School (HKS). Identifying poor-quality facilities provides an opportunity for rapid improvement by bringing best practices to bear, Chandra said. Baicker agreed, saying such targeted interventions can prove both effective and inexpensive. Government-led, policy-driven shifts on health care have led to dramatic improvements in the past and could again, Chandra said. When U.S. hospitals were desegregated in the 1960s, there was “overnight” improvement in African-American infant mortality. Similarly, Chandra said, new technology could help disadvantaged populations by improving their care condition by condition. The discovery of surfactants, for example, helped all premature babies breathe better, but benefitted African-American babies in particular because they were more often premature. Similarly, McGuire said, attitudinal health reforms, such as against stereotypes and race-related disparities, could create a wide ripple effect. “Activation” training, during which patients from disadvantaged populations are encouraged to question physicians and immerse themselves in their own care, could improve their interactions in everyday life as well. “The next time they interact with someone outside the health care system, this is going to help them there, too,” McGuire said. While policy shifts can be powerful tools against health inequities, Subramanian said that such initiatives should be aimed not at outcomes, but earlier in the chain at the factors influencing health. “From a health perspective, the most important thing to think about would be inequalities in opportunities that are health-promoting, rather than inequalities in health outcomes per se,” Subramanian said. Another helpful policy change would relax America’s relatively stingy family-leave and sick-time policies, Kawachi said. Among its less-publicized features, the ACA promotes “accountable care organizations,” whose financial rewards are linked to better patient outcomes rather than to just providing treatment, thereby linking financial success to patient health. But eliminating health disparities outright remains problematic because some causes lie outside the care system. Poor education often leads to low-wage jobs, leading to substandard housing and poor diets and smoking, further leading to diabetes and asthma. So any overarching solution would require massive breadth. Addressing those social and behavioral factors would require government officials and community leaders to think innovatively and cooperatively about the everyday realities that affect health, even down to the designs of neighborhoods and transportation systems. There would have to be more flexibility for health care spending to help, for example, an asthmatic child whose medication might be covered but whose need for an air conditioner is not. Physicians would need to be aware of nonmedical pressures that patients face after leaving their offices that might, for instance, leave them without transportation to follow-up appointments or to pharmacies for medicine. Partner organizations would need to help meet routine needs by such things as grocery shopping and cooking for postoperative patients who are well enough to go home, but can’t yet push carts down store aisles. Nancy Oriol, HMS dean of students, has been part of a 24-year experiment to hurdle some of those barriers, seeing patients as whole people and meeting them literally where they live. As director of obstetric anesthesia for Harvard-affiliated Beth Israel Deaconess Medical Center in the 1980s, Oriol became concerned about infant mortality rates in the poor neighborhoods near Boston’s Longwood section, where HMS and several of its most prominent affiliate hospitals are located. She and Cheryl Dorsey, then a third-year medical student, began to develop a mobile clinic, the Family Van, that provides basic health education, screenings, and referrals to residents of poor neighborhoods. Though Oriol no longer works on van issues day-to-day, she is probing how the nation’s estimated 2,000 mobile clinics can fill a gap in America’s health care network. Early on, she hoped that the Family Van would become obsolete as the health care system improved. But now Oriol sees the mobile clinics as an emerging sector, a permanent player with their own mission. In another example of fresh thinking, at HMS’s five-year-old Center for Primary Care, co-director Andrew Ellner, an assistant professor of medicine, is tackling a root cause of health disparities: poor primary care. According to a 2009 report by the National Association of Community Health Centers, a whopping 60 million Americans lack adequate access to primary care. Ellner said that even people who do have access are often poorly served by what they get. Good primary care requires correct responses to illnesses, injuries, and other conditions, coupled with strong preventive medicine, including administering vaccines and routine screenings, while encouraging healthy diet and exercise. Another critical factor, Ellner said, is properly coordinating care with other providers, including specialists, therapists, and technicians. Internationally, the United States has a reputation as a country with poor primary care. That reality is a significant factor in high health care costs, even though, Ellner said, there are pockets of excellence that provide primary care as good as anywhere in the world. The challenge, he said, is to scale up those examples nationally and make them the rule rather than the exception. In another shift, the HMS center has partnered with seven Harvard-affiliated health systems to install a team-based approach to care. The teams, which are being tested in 28 Boston-area practices serving 300,000 patients, include physicians, nurses, social workers, community health workers, and pharmacy technicians. Larger social factors play a role in health. Kawachi said studies have shown that preschool programs deliver $1.17 of benefits for each $1 invested. Since poverty is a root cause of health disparities, an increase in the federal minimum wage — which at $7.25 an hour leaves a family of four well below the federal poverty line ― would prove a health boon as well, he said. The ACA recognizes the need to address the exterior causes of health disparities, McDonough said, but those aspects of the law haven’t been taken seriously. For instance, political opponents have attacked the $15 million Prevention and Public Health Trust Fund that provides grants to address poor housing, air quality, and lack of exercise, calling the spending wasteful. Legislators have cut a third of its funds. Despite the endless political tug-of-war over the ACA, Baicker believes that there will be more opportunities soon to experiment with health care reforms, if only to slow cost increases, which have picked up speed. Rear Adm. Timothy Ziemer of the President’s Malaria Initiative and Dyann Wirth, director of the Harvard Malaria Initiative, were part of a Harvard Global Health Institute panel on the quest to eradicate malaria.